Q. How do I find out which graphics card installed in my Linux desktop system? I’m using Ubuntu Linux. I don’t want to open up the computer hardware to just see the make and model of the graphics card in a system. A. You don’t have to open the hardware to see the make and model of the graphics card in a system. There is direct method provided by using lspcicommand. Look for video controller / vga keywords in above output listing. Nothing ever need be a mystery on Linux as it has a large number of excellent utilities for discovering hardware and monitoring hardware health. Here are a handful of good tools for spotting possible hard drive failure, displaying hardware information and monitoring temperatures, fans, voltages, email, music players and more. GSmartControl provides an excellent graphical interface to smartmontools. You're probably familiar with the excellent smartmontools for monitoring hard drive health, and getting early warning of possible drive failure. Smartmontools runs tests and reads data on drives that have the Self-Monitoring, Analysis and Reporting Technology (S.M.A.R.T.) system built into them. It's been around seemingly forever, but did you know there is a graphical interface for it? SmartControl puts a nice interface on smartmontools and supports all of its functions. You can run a short or long self-test with a button click, and GSmartControl is especially valuable for quickly and easily finding log files and reading SMART attributes data, reading test results, and seeing detailed data on your hard drives. I wish for a nice graphical front-end and alerter to lm-sensors; GNOME and KDE release nice ones and then they disappear. Xsensors is simple, the xfce4-sensors-plugin looks great in XFCE, and the KDE4 System Monitor widget is all right, but it's not very configurable and does no alerting. psensor is a rather nice, and it can run as a server for remote monitoring. GKrellM is an old favorite cram-full of features, alerting, and configurability. Conky takes the prize for most objects supported. In addition to the usual system monitors it monitors email, music players, instant messaging, logfiles, weather forecast, and pretty much anything you want. If there isn't a plugin to do what you want you can write one. 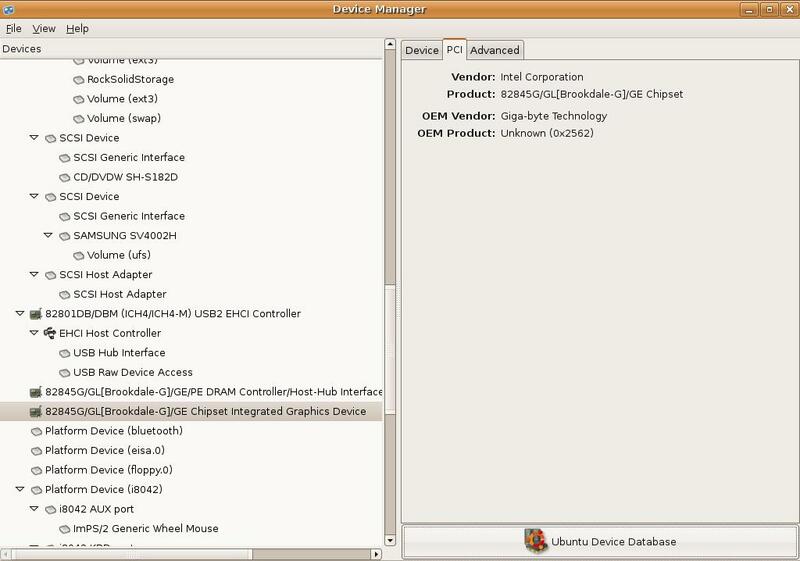 lspci with no options shows a hardware list with vendor names, chipsets, and device types. lspci -t displays a tree view that shows the relationships between your devices. The vendor names, chipsets, subsystems, device classes-- all the information displayed by lspci comes from a giant database, the PCI ID Repository. You can update your local copy of this database, /usr/share/misc/pci.ids, by running the update-pciids command as root. dmidecode is a wonderful utility for getting information about everything on your motherboard without opening the case, or booting to the BIOS. If you run dmidecode with no options it spits out pages of data. You can select what you want to see by consulting the DMI types table in man dmidecode. Here are some examples. How much RAM does your motherboard support? What are the onboard devices, such as video, networking, sound? And much, much more, which is all detailed in the man page. The lshw command also gives a detailed peek inside your PC, and you can invoke its graphical view with lshw -X (left). It's a little weird to navigate, but everything is there.